I have been inspired to write this article on Sant Dadu Dayal (1544—1603) of Gujarat and Rajasthan by seeing the entry on 22-2-2010 in the Sanatan Almanac (Hindu Calendar rooted in Sanatana Dharma) published by Sanatan Sanstha in Goa. The entry on this date relates to ‘Dadu Dayal Jayanthi, Rajasthan, Gujarat’. 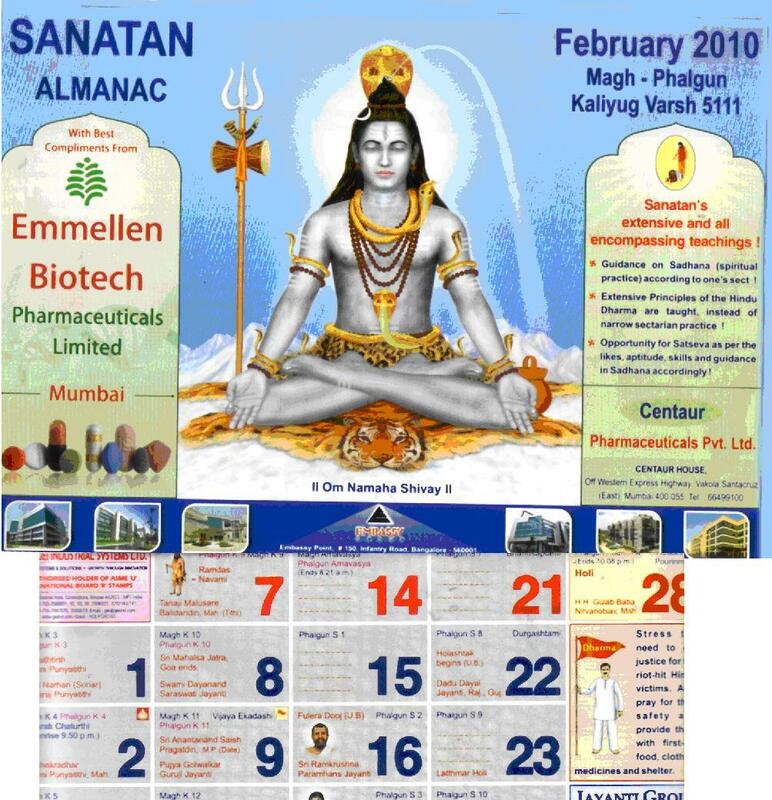 This great Hindu Calendar of Sanatan Sanstha is a veritable Hindu Encyclopedia. It is a spiritual power station of our timeless Hindu tradition. It is a storage warehouse of the most precious jewels of Hinduism. It is a Hindu Library; a great Hindu Amphitheatre; a Hindu Museum; a Hindu Hall of Timeless Archives; a seat of Hindu Justice and above all a seat of Informal Hindu People’s Government. This beautiful Hindu calendar rooted in Sanatana Dharma is now available in five languages–Marathi, Hindi, Kannada, Telugu and English. I understand efforts are afoot to bring out this Hindu calendar in two more languages—Tamil and Malayalam. It is absolutely necessary in the larger national interest of promotion of Hindu Unity and Hindu Solidarity to bring out this calendar in all the major languages of India without any further delay. I offer my reverential salutations to Guruji H.H.Bhaktaraj Maharaj and his chosen disciple Guruji Dr.Jayant Balaji Athavale for giving us all the blessing of seeing and using this Hindu Calendar everyday. Dadu Dayal Jayanthi falls today (22-2-2010). Dadu Dayal (1544-1603) was a great saint from Gujarat who spent the best part of his spiritual life in Rajasthan. Consequently he has thousands of devotees both in Gujarat and Rajasthan who worship him with great reverence and devotion. “Dadu” means brother, and “Dayal” means “the compassionate one”. Very few authentic details relating to the early life of Dadu Dayal ji Maharaj are available. Born in Ahmedabad in 1544, he made Rajasthan his home. Like Saint Kabir, Dadu came from one of the many lower artisan castes. It is said that Dadu was a foster son of Lodhi Ram, a Naga Brahmin of Ahmedabad, who had found the infant floating on the waves of the Sabarmati river in 1545. Dadu Dayal lived in the Jaipur region of Rajasthan, most probably as a pinjari, a cotton carder. He married and had a family of two sons and two daughters. 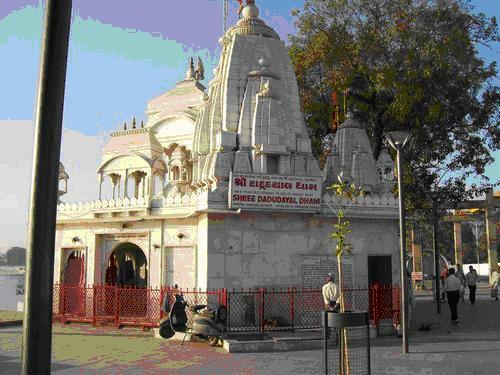 He attained Samadhi in Naraina in Jaipur district in 1603. Emperor Akbar is said to have been one of his followers. Dadu Dayal is one of the major representatives of the Nirguna Sant traditions in Northern India. He gathered around himself a group of followers, which became known as the Dadu-panth in his own lifetime. This organization has continued in Rajasthan to the present-day, and has been a major source of early manuscripts containing songs by the North Indian saints. Dadu ji had 100 disciples who followed his teachings and attained salvation. He instructed an additional 52 disciples to set up ashrams, known as ‘Thambas’ around the region to spread the Lord’s word. Five thambas are considered sacred by the followers, namely, Naraina, Bhairanaji, Sambhar, Amer, and Karadala (Kalyanpura). Followers of these thambas then spread and set up other places of worship. 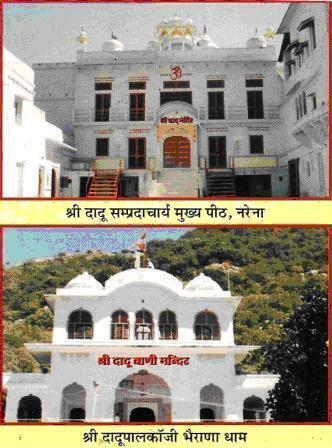 Shri Dadu Dham Bhairana, which lies in the secluded hilly tract of Bichoon district in the Jaipur division of Rajasthan, has become a sacred place of pilgrimage for lakhs of devotees of Saint Dadu Dayal Ji Maharaj from Haryana. The devotees come from Punjab, Himachal Pradesh, Delhi, Uttar Pradesh, Madhya Pradesh, Gujarat, Maharashtra and other parts of the country. They hold the place in reverence. The remaining part of the story relating to the eternal importance of Bhairana in the life of Daduji Maharaj can now be told. Accordingly, when Dadu Ji Maharaj breathed his last on in 1603, his body was taken in a palanquin from Naraina to Bhairana and placed there in its gorge by thousands of his disciple-saints. When they were engaged in a discussion regarding the last rites to be performed, a supernatural incident is said to have occurred all of a sudden. 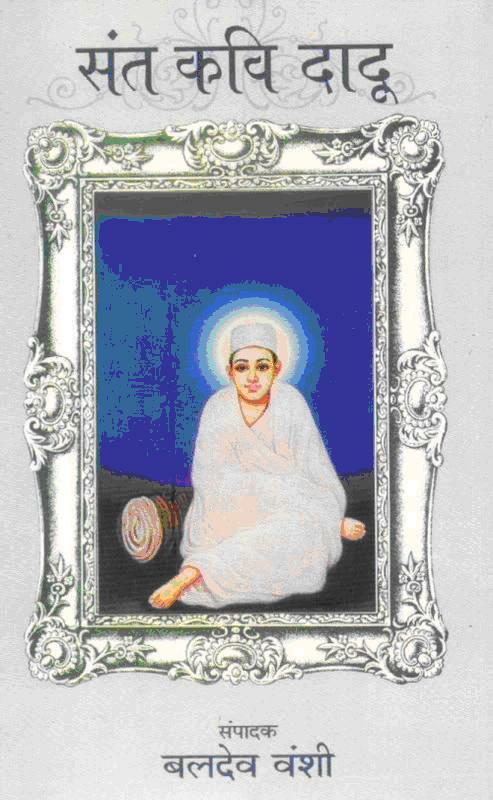 Tila Ji, a disciple-saint of Dadu Ji Maharaj, saw his guru standing at the gate of a cave near the hilltop. He brought it to the notice of others too. Instantly Daduji Maharaj spoke “Satya Ram” to all and then vanished into the cave. According to the legend and tradition, the palanquin also disappeared and only some flowers were left there. The devotees had to remain contented with performing the last rites with those flowers at that site where now stands a large memorial, which is sacred to the Dadu-panthis. The place is now popularly known as Dadu Khol or Dadu Ganga where ashes of saints, sadhus and other devotees of the Dadu cult are scattered at this sacred spot very much like the immersion of the ashes of the Hindus in the River Ganga at Haridwar. Dadupanth even today is a strong movement in the States of Gujarat, Rajasthan, Haryana and the adjoining regions. Daduji belongs to the lineage of Nirguna Sants like Kabir and Guru Nanak. The Vaishnava Sant tradition developed in Maharashtra and it focused on devotion to a “Saguna” form of Lord Vishnu or Lord Krishna. Another Sant tradition developed in several parts of Northern India and more particularly in the Punjab which advocated devotion to a ‘Nirguna’ form of the Lord viewed as the ineffable absolute without shape or form, the source and support of the Cosmos, by Whose Grace beings are liberated from the cycle of birth and death. Kabir, Guru Nanak, Meera Bai, Ravidas and Dadu Dayal belonged to this Nirguna Sant tradition. Dadu Dayal was a great poet-mystic and spiritual Master of Divine Light, Sound, and Nirguna Bhakti from Rajasthan in the lineage of Guru Kabir. Dadu alludes to the bliss of Sahaja in his songs. Much of the imagery used in his songs is similar to that used by Kabir, and similar also to that used by the earlier Sahajiya Buddhists and Nath yogis. Dadu’s compositions were recorded by his disciple Rajjab and are known as the Dadu Anubhav Vaani, a compilation of 5,000 verses. His songs are in a Hindi dialect known as Braj Bhasa, being a mixture of Hindi and Rajasthani. Janagopal another disciple of Dadu Dayal wrote the earliest biography of Dadu. the Negative Power can never consume him. then dogs bark in vain. one is firmly established in blissful meditation. he then drinks the divine Nectar, 0h Dadu. millions of obstacles are removed. burns a huge amount of wood, 0h Dadu. are burnt up in the fire of separation. the vision of the Beloved, 0h Dadu. whereas the practice of the Saint is within. hence no accord is found between them. 0h Dadu, without any contents? Such are the ones who make outer display of religiosity. your heart, 0h Dadu, and be obedient to such a Saint. the two are as far apart as earth and sky. the mimic pins his hopes on the world. Day and night I repeat His Name. keep that within your heart. this is the teaching of all Saints, 0h Dadu. We can see the essence of similarity between the above verse and the following verse of Kabir titled ‘Weaving Your Name’. Kabir too was a mystical poet like Sant Dadu Dayal. Kabir belonged to the 15th century. Both Kabir and Sant Dadu Dayal belonged to the Nirguna Sant Tradition. To make my garment when you come to me. The sun and moon hear while I count your name. To deposit in the lotus bank of my heart. And to comb the twists and knots of my thoughts. No more shall I weave a garment of pain. On the loom of my mind. I would also like to give another example from the same Nirguna Sant Tradition. Ravidas was a Hindu cobbler of 15th century Varanasi. He is remembered for his beautiful hymns and his gentle piety which drew many seeking souls to his shoe shop. I am presenting below a poem by Sant Ravidas titled ‘The City of God’, Considered one of his most beautiful poems. Grieve Not is the name of my town. Philosophy in India is essentially spiritual. It is the intense spirituality of India, and not any great political structure or social organization that it has developed, that has enabled it to resist the ravages of time and the accidents of history. External invasions and internal dissensions came very near crushing its civilization many times in its history. The Greek and the Scythian, the Persian and the Mughal, the French and the English have by turn attempted to suppress it, and yet it has held its head high. India has not been finally subdued and its old flame of spirit is still burning. Throughout its life it has been living with one purpose. In every age it has fought for truth and against error. The saints and sages of India throughout its long and chequered history have striven for a socio-spiritual reformation of the country. The idea of Plato that philosophers must be the rulers and directors of society has always been practiced in India. The ultimate truths are truths of spirit, and in the light of them actual life has to be refined. From the beginning of her history India has adored and idealized, not soldiers and statesmen, not men of science and leaders of industry, not even poets and philosophers who influence the world by their deeds or by their words, but those rare and more chastened spirits whose greatness lies in what they are and not in what they do; men who have stamped INFINITY on the thought and life of the country, men who have added to the invisible forces of goodness in the world. They are the saints and sages, the sants, the rishis and the maharishis of India. To a world given over to the pursuit of power and pleasure, wealth and glory, they declare the resplendent splendour and transcendental reality of the unseen world and the eternal clarion call of the spiritual life. 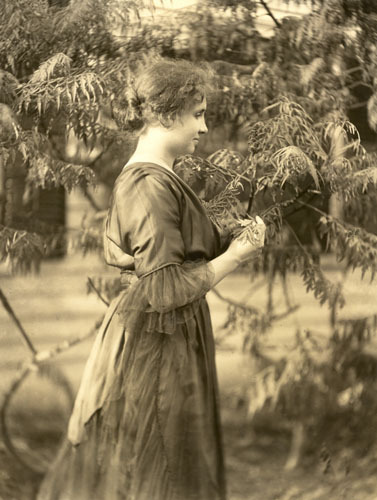 Their self-possession and self-command, their strange, deep and subtle wisdom, their exquisite kindness and courtesy, their humility and gentleness of soul, their abounding humility, proclaim that the destiny of man is to know himself and thereby further the universal life of which he is an integral element. This supreme ideal has dominated the Indian religious landscape for more than 50 centuries. Sant Dadu Dayal Maharaj whose Jayanti falls today (22-2-2010) belongs legitimately to this continuous, ancient and unbroken Hindu Tradition. Born on 28th August 1942 at Tiruchirappalli, South India, V. Sundaram had his education in Simla and New Delhi. He took his B.A. (Hon.) Degree in Economics from St. Stephen’s College, Delhi in 1961. He also took his M.A. Degree in Economics, with specialization in Industrial Economics, from Delhi University in 1963. He worked as Lecturer in Economics in Delhi University for two years till he joined the Indian Administrative Service (I.A.S.) in 1965. He was allotted to Tamil Nadu Cadre and has served with distinction in several high positions in Tamil Nadu Government from 1966 to 1994. He sought his voluntary retirement from the I.A.S. in 1994. His record as Development Administrator in Tamil Nadu has been outstanding. He was the first Chairman of Tuticorin Port Trust. He was the architect responsible for undertaking and completing all the Port Works relating to the creation of breakwaters, the Oil Jetty and the Coal Jetty in Tuticorin Port. On account of his dynamism and vision, Tuticorin Port was put on the Maritime Map of South East Asia. In the field of Social Welfare, he has been devoted to the welfare and rehabilitation of the physically handicapped, particularly the patients suffering from leprosy. As Director of Social Welfare, he established 10 Homes in Tamil Nadu for the rehabilitation of vagrant beggars afflicted with leprosy and leprosy patients languishing below the poverty line. After coming out of the Government in April 1994 he has held several responsible positions both in the public and private sector. He was Administrator of the World Bank assisted National Highways Project relating to four-laning of the National Highway from Cuttack to Kolkatta with Headquarters in Bhuvaneshwar. He was Secretary-General of Hindustan Chamber of Commerce, Chennai for two years. Till January 2010, he was working as Associate Editor of News Today (a daily in English from Chennai) and Malai Sudar (a daily in Tamil from Chennai). As a fearless journalist, he has contributed, over a period of 5 years, more than 2500 articles in the field of economics, literature, art and culture, religion and philosophy, apart from politics and public affairs. He is known for his forthright, hard-hitting and fearless journalism. His watchwords are S G S T—Stern Grim Scorching Truth! He is known for his independence and courage of conviction. His motto is: “without courage there can be no truth and without truth there is no other virtue”. As a lover of books he has a large private library, full of rare and antiquarian books. He has authored several books and monographs. V. Sundaram is a lover and keen student of Carnatic Music. He is a trained Mridangam Player (a percussion instrument like the drums). He has a rare and magnificent collection of rare audio voices of great statesmen and men of history, scholars, philosophers and poets of international fame. A keen collector of South Indian art, he has donated several bronzes and other art objects to the Madras Museum. V. Sundaram is married to Padma who comes from a family of distinguished Sanskrit scholars. He hails from Ennappadam village near Palghat, Kerala. His wife Padma Sundaram hails from Tondikulam Village, near Nurani Village near Palghat Town, Kerala. Among many other things, V. Sundaram has been greatly influenced by the writings of Hans J. Morgenthau (1904-1980) and Sir Winston Churchill (1874-1965). 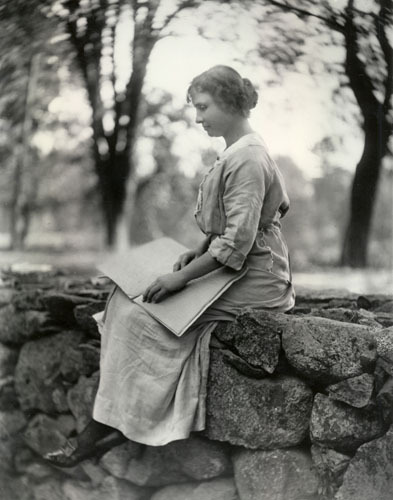 To be able to work in the service of a great idea, on behalf of an important goal; to be able to commit every nerve, every muscle, and every drop of sweat to a work, to a great task; to grow with the work, to become greater oneself in the struggle with one’s betters’ and then to be able to say at the end: I die, but there remains something that is more important than my life and will last longer than my body: my work. That is my hope, which is worthy of tremendous efforts, that is my goal, for which it is worth living and, if need be, dying. maharaj ji i am in lots of problem since last one year. you are a minister since last year why you have money problem? I think this is a very gud resurch from your side. It’s very gud to let pepol know about Sant Shree Dadu dayal ji.